Art for an 8-page (or 8-panel) Halloween-themed strip I did for an independent publication in 1999, which was never published. This lot consists of eight 7" x 11" size sheets of bristol, each with a 6" x 6" ink drawing. 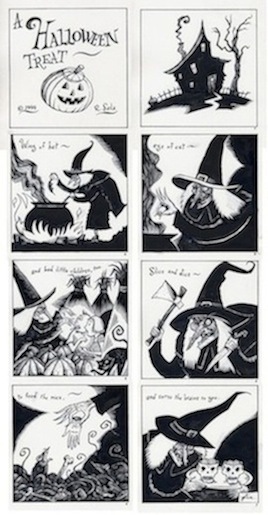 The strip is a little nursery-rhyme type of poem about a witch making her special "Halloween treat." This strip has never been published and I haven't posted it "officially" on the internet yet (I'm saving that for this Fall). Sorry for the small size, due to the CAC size restrictions. You can go here for a better look: http://hereliesrichardsala.blogspot.com/p/shop.html Each piece is clean and tight with minimal white-out/corrections. Each individual page/panel will be neatly signed.